It’s finally a decent Thursday NFL matchup this week with Pittsburgh vs Carolina, and two potential Hall of Fame quarterbacks in the line up, namely the Steelers’ Ben Roethlisberger and the Panthers’ Cam Newton. Both clubs are capable of reaching the Super Bowl with the right breaks, although certainly neither is favored in their respective conference. The Panthers vs Steelers odds for Thursday night are definitely enticing. Just like this past Sunday was only the second and likely the last regular-season meeting ever between HOF quarterbacks Aaron Rodgers and Tom Brady, the same applies here. Cam and Big Ben faced off in 2014, resulting in a 37-19 Steelers victory in Charlotte. It was Pittsburgh’s fifth straight win in the series after the Panthers won the first-ever meeting in 1996. Pittsburgh is a 5-point favorite and our pick to cover the spread in these Panthers vs Steelers odds. The Over/Under line for this game is at 50 points. 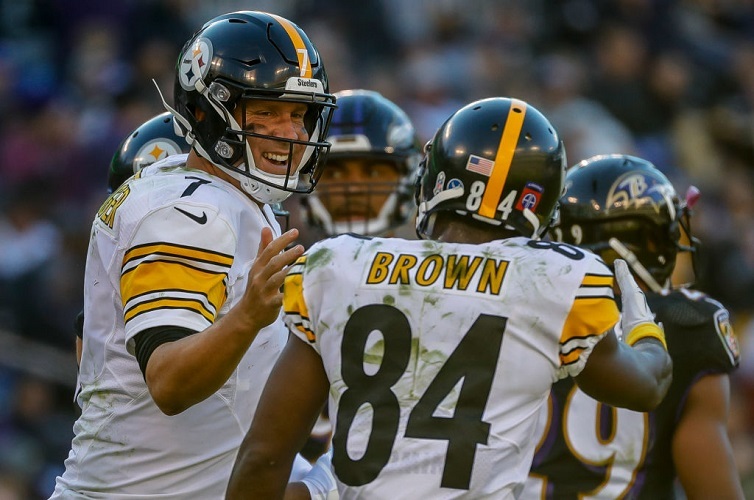 The Steelers are atop the AFC North and won their fourth straight game on Sunday, a 23-16 victory against bitter rival Baltimore – which had won in Pittsburgh back in Week 4. The Steelers haven’t lost since. They continue to be without holdout Pro Bowl running back Le’Veon Bell, maybe the best in the business, but he hardly has been missed. Backup James Conner has been just as good, and had a fourth straight 100-yard rushing game Sunday. Conner is second in the NFL in rushing. We presume Bell won’t show up on a short week. Roethlisberger also has played well during the winning streak, but the clear difference has been a defense that hasn’t allowed more than 21 points in any of the past four games. It surrendered an average of 29 points in the first four. Carolina could beat anyone in Charlotte and improved to 5-0 there with Sunday’s 42-28 win over Tampa Bay. Meanwhile, the Bucs have the NFL’s worst defense and the Panthers exposed that to the tune of a franchise-record 35 first-half points. Christian McCaffrey had 157 yards from scrimmage and two touchdowns, and Newton threw for two scores. His seven-game streak with at least two TDs passing is a personal best. And Newton remains one of the league’s top running quarterbacks. Carolina is second in the NFL in rushing. The Panthers have a better record than the Steelers, but are second in the NFC South because the Saints are 7-1. That division had three playoff teams last year in New Orleans, Carolina and Atlanta and could again. The NFL odds for this game opened with the Steelers as 4-point chalk. The total has stayed steady at around 50 points. The Panthers are 1-4 against the spread in their past five on a Thursday. Carolina is 2-5 ATS in its past seven following a win.